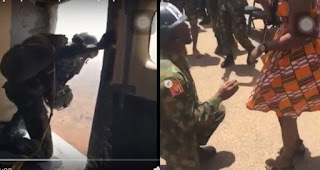 A Nigerian solder has jumped from a plane using a parachute just to propose to his girlfriend in a spectacular manner. A video has shown the moment a Nigerian soldier made sure he proposed to his girlfriend in the most spectacular way possible. The soldier, identified simply as Danladi actually jumped from a plane with the aid of a parachute all just to propose to the love of his life identified as Anita. In a rather scary video which is going viral online, the soldier is seen jumping from the inside of the plane. Some of his fellow soldiers also accompany him down as they flew out of their aircraft to the ground where the girl was waiting. When Danladi got to the ground, he went on one knee and popped the big question. Of course, the lady accepted.